To claim this profile, please confirm you are Camara Morgan. To follow this profile, please let us know your relationship to Camara Morgan. The Ossining varsity basketball team lost Saturday's neutral playoff game against Christ the King (Middle Village, NY) by a score of 81-76. RESULTWin Girls varsity basketball vs. South Shore. The Ossining varsity basketball team won Friday's neutral playoff game against South Shore (Brooklyn, NY) in overtime by a score of 81-76. Camara's basketball stats have been updated for the win vs. West Genesee. RESULTWin Girls varsity basketball vs. West Genesee. The Ossining varsity basketball team won Sunday's neutral playoff game against West Genesee (Camillus, NY) by a score of 93-46. This game is part of the "2019 NYSPHSAA Girls Basketball Championships presented by the American Dairy Association North East - Class AA" tournament. RESULTWin Girls varsity basketball vs. Longwood. The Ossining varsity basketball team won Saturday's neutral playoff game against Longwood (Middle Island, NY) by a score of 68-54. Camara had 2 photos tagged from the game against Monroe-Woodbury. Camara's basketball stats have been updated for the win vs. Monroe-Woodbury. RESULTWin Girls varsity basketball vs. Monroe-Woodbury. The Ossining varsity basketball team won Saturday's neutral playoff game against Monroe-Woodbury (Central Valley, NY) by a score of 67-34. Camara's basketball stats have been updated for the win vs. Elmira. RESULTWin Girls varsity basketball vs. Elmira. The Ossining varsity basketball team won Tuesday's neutral playoff game against Elmira (NY) by a score of 98-58. RESULTWin Girls varsity basketball vs. Ursuline. The Ossining varsity basketball team won Saturday's neutral playoff game against Ursuline (New Rochelle, NY) by a score of 78-67. RESULTWin Girls varsity basketball vs. Albertus Magnus. The Ossining varsity basketball team won Monday's neutral playoff game against Albertus Magnus (Bardonia, NY) by a score of 66-38. Camara's basketball stats have been updated for the win vs. Arlington. RESULTWin Girls varsity basketball vs. Arlington. The Ossining varsity basketball team won Saturday's home playoff game against Arlington (LaGrangeville, NY) by a score of 97-61. Camara's basketball stats have been updated for the win vs. New Rochelle. RESULTWin Girls varsity basketball vs. New Rochelle. The Ossining varsity basketball team won Thursday's home playoff game against New Rochelle (NY) by a score of 102-41. RESULTLoss Girls varsity basketball @ Ursuline. 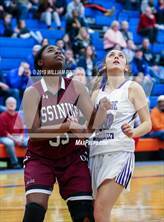 The Ossining varsity basketball team lost Thursday's away conference game against Ursuline (New Rochelle, NY) by a score of 66-59. Camara's basketball stats have been updated for the win vs. Kennedy Catholic. RESULTWin Girls varsity basketball vs. Kennedy Catholic. 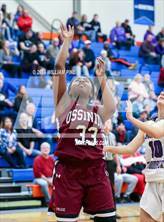 The Ossining varsity basketball team won Wednesday's home non-conference game against Kennedy Catholic (Somers, NY) by a score of 99-63.